This Portuguese influenced dish from Goa is one of the best loved Indian curries in UK. Most Indian restaurants have it on their menu. Traditionally it was made with pork. However, as most curry house chefs in UK were Muslims from Bangladesh, they did not cook or eat pork. They replaced it with beef or chicken, which is what present day UK Vindaloo is usually made with. It sometimes has chopped potatoes added to it. Vindaloo doesnt have to be so hot that your mouth burns. My theory about extra hot curries in UK restaurants is that they want to sell more beer/wine to their customers, so make it hot! Here, I have made it in a slow cooker, which would be like cooking it in a sealed 'Handi', an Indian earthenware pot, on low fire/charcoals. It couldnt be simpler, give it a try. 1 heaped tsp. chilli powder- adjust to your taste. Dry roast ingredients marked * in a wok or in a microwave, adding chillies only towards the end. Chillies burn quickly and become bitter. This takes about 3-4 minutes in a hot wok. Place onions, ginger, garlic, chilli powder, turmeric, salt, roasted whole spices marked*, water and vinegar in a blender and make a fine pur. Taste and adjust spices, salt and vinegar. Mix with pork. Leave in a fridge to marinate for a few hours or overnight. Transfer to a slow cooker and switch it on. Heat oil in a tempering ladle or a small pan. Add mustard seeds. When seeds splutter, add whole red chillies and curry leaves. Stir with a spoon for a few seconds to make sure all leaves and chillies get fried. Pour over the meat in the slow cooker, stir. Add a little water, if it looks like it needs it for a gravy/sauce. Let it cook until pork is tender and the oil floats to the top. 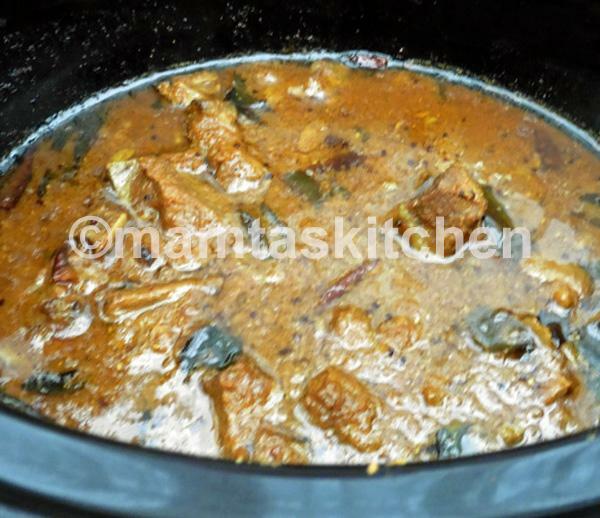 I cook it on Auto, but you can select programmes according to your slow cooker instructions. It takes 6-7 hours**. Serve with Boiled/Steamed Rice and natural yoghurt. Yoghurt is to cool down your mouth! You can add diced potatoes halfway through cooking. If you want it fiery hot, add more chillies and black pepper than given in this recipe. **Slow cookers vary in their cooking time and performance. First time you make it, try to work out which setting work best for you, how long it takes you to cook, by checking from time to time. Adjust time according to your observation.